""LT : And for sure all evidence for cutting demolition was in the first three days already disappeared. By the small group of fake "first respondents", especially hired for that task, from one of your beloved Agencies."" Another blatant falsehood. How from a pile that took 3 months of heavy equipment to move? How would it be possible to get through the edges of the debris field to work the heart of the collapse and remove evidence. From 1,000,000 tons of rubble supposedly cut floor by floor to achieve the witnessed collapse rates. The areas of collapse initiation buried under at least 11 and 29 floors of rubble. From a smoldering pile that had to be constantly sprayed and cooled with water to allow workers to move and remove debris. Thanks for your willingness to repeat any truth movement lie. To explain this, is an easy one, you clearly don't understand the utterly importance from the total lack of any PRESERVED buckled core column steel from collapse initiation floors of all three WTC towers, by first FEMA, then The 9/11 Commission and last but not least, the NIST. They HAVE NOT ONE PIECE of that for their collapse theories, so utterly important core column and facade column buckled steel, from the three collapse initiation floors in all three towers. Because, if you can't offer that buckled steel evidence, AND YOU CAN'T, all these three reports can be thrown immediately in the dust bins they belong in. Kevin : 8 o'clock at night, on the 11th, tons and tons of beams that were CUT, NO iron-workers to do work..! I'll spell it out for you : He saw already at 20:00 hr in the evening of 9/11/2001, just two hours and forty minutes after WTC7 collapsed at 17:20 hr, a whole wood of CUT steel beams....CAPICE ? There were no welders/cutters with acetylene cutting flask anywhere to see in that short time after the last collapse. But they had readily at their hands, HUNDREDS of BRAND-NEW dump-trucks, filmed while turning a corner at a crossroads near Ground ZERO, in the dark of the evening, to start hauling away the WTC7 EVIDENCE STEEL.! All equipped with GPS positioning soft and hardware, to be sure that incriminating evidence was not handed over to eventual doubting citizens. Which was in any case not very logical, in those very first days and weeks, when all of the USA's citizenry was set in Murder some Muslims Mode by those endless TV main channel news repeats. And they cordoned the whole Ground Zero grounds off, based on their lie, that it was a criminal investigation matter ....then these damn lying FBI officials should have ordered to preserve any identifiable piece of steel from the collapse initiation floors, following their OWN iron clad protocols. Which they NEVER did. How much more criminal can such an investigation become, any more than that.? Against EVERY protocol in every book about fenced-off criminal investigation grounds. It was however of course a criminal de-escalation site, full of officials, assisting official criminals higher up, who's only task was, to stop any "looting" of evidence. Guess what evidence they meant...incriminating evidence, against their false flag operations on 9/11, of course. Thus, I task you to find us any kind of official report with photos of buckled steel from those essential regions I described already too many times to OS trusting members here, who can play dumb on these kinds of evidence, but can play smart on subjects that were already hundreds of times proven to every reader here to be facts, but get heralded as their own smart conclusions. And I demand descriptions and markers on the steel, and descriptions of the placement of that steel in the debris pile, also with photographs and accompanying texts. I can predict, that not any of you, OS trusters, will ever find such evidence. Why? Because we would have been flooded with it, 15 years ago already.! Which would have stopped EVERY 9/11 opposition in its tracks.! Which absence of evidence thus clearly indicates, that all those hundreds of millions spend on official 9/11 investigations, were simply total false flag operations. The real professionals in the FBI and in the Engineering world must have realized that, shortly after the first sifting, which showed-up no buckled steel at all from the only interesting parts of the piles. Dumped at the periphery of the piles, since all evidential peripheral steel was mushroomed out to the furthest explosive circles. And evidential core columns were sinking down into their footprints, only leaving their explosively diagonally cut stumps behind. Which Kevin McPadden saw that 9/11 night at 20:00 hr, in abundance.! Easy to hide, by placing iron-workers with acetylene torches and gas cylinders near them, and photograph them, as soon as possible in the days after 9/11, and throw these photos all over the net, resulting in nullification of evidence, without anyone in the FBI or any other agency, daring to say that they saw cut stumps all over the place, already on 9/11. And these wondering officials realized they would go against a Moloch of financial criminals at the top of your utterly corrupt country. And they all bowed...as the discreet civil servant cowards they were. The buckling is right there in the video record for the towers. And there is vertical buckled columns in the shap of U’s from overloading. What should the bucking look like? Bent steel? Which was present in the rubble. 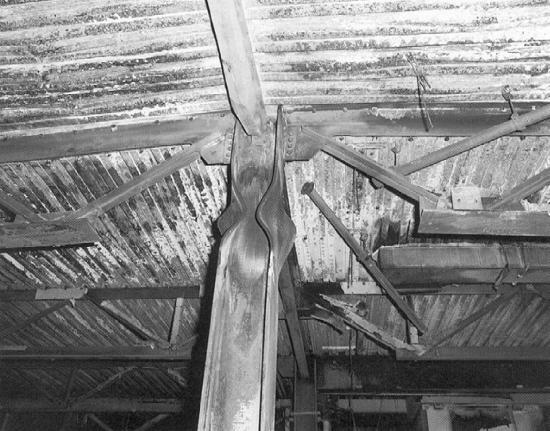 Than after the initial buckling, the main failures were sheared or stretched floor columns and broken welds. For WTC 7, thermal stress lead to broken floor connections and bolting. The columns at WTC 7 buckled from loss of lateral support. Again, there was bent and deformed steel at WTC7. And there was no identity marks on the columns of WTC 7. Is that false? How would you even identify the steel like the marked columns from the towers? Sad to see your arguments descend into truth movement lies, and the evidence of buckling right there in the video record. You had to desperately omit this very snippet at the first lines of your article link, to let the rest of your handpicked texts sound expertly solid. You OS trusters get more and more desperate, evidenced by the level of insults in about every OS truster post nowadays. BUCKLED core columns that underwent office fires heat exposure, like in the WTC1, 2 and 7 steel failure initiation phases means WARPED, PUSHED-IN, DEFORMED, all happening inside the same vertical plain that all CORE columns stood in on non-plane impacted floors, after being in hot office fires for maximum 30 minutes, which is the time all combustibles are consumed in office fires, after which these fires extinguish. Thus not bent (side-wards), curved (out of line), etcetera. And NIST just proposed any amount of cut core columns, NOT to be seen in total or individually, in both plane impact holes. It's numbers are by far not definitive. It's simply said, a GUESS. Not even an educated one. All your nitpicking aside (I'll address that WTC7 debris photo in the next post), this is the upper part of a HEATED CORE column top part, exposed to far longer and thus more extreme fire conditions, set in a fixed environment, fixed by 4 side beams and by a whole composite concrete on steel beds, floor area on top of those beams and around that CORE column. And under those floors in that picture were the same kind of trusses, but single ones, not pairs as in the Twin Towers. Which were not deformed at all. Why? Read the explanation by Prof. Bazant already given earlier on, some pages back. Thus, when expanding and contracting floor trusses (which thus NOT sagged, says Prof. Bazant) were the hypothetical cause of that inward bowing (BENDING) effect on the perimeter columns, we see in videos from shortly before global collapses of a Twin Tower, you have to regard that in such a hypothetical scenario, those still straight trusses thus first had to expand about 55 inch +/- 6 inches (1.4 m (+/-0.15 m), while still being fairly straight (says Prof. Bazant), thus causing the perimeter walls first to bulge outwards for the same distances. Then, after cooling slowly down, after the fires eventually extinguished (which they didn't) these bulges should slowly disappear. Which we don't see at all happening. The perimeter walls caved inwards, without any preliminary bulging outwards. That 55 inch expansion is calculated for a fully in fire emerged beam. Which the video records shows exactly zero evidence for. We can't look into the few burning offices no deeper than about five meter max, by the way. The whole NIST theory for 3 towers is build on quicksand. And the fact that not one US institution did preserve those most important steel parts from the on-fire floors, and even more important, from the initiation floors, says it all. It was and still is an ongoing whitewash operation, guided by the culprits themselves, the 9/11 Planners. So? You have no actual proof of CD from the video, audible, or seismic record. There is no evidence of pressure waves with the force to cut steel columns. No evidence of splinter steel being ejected from explosives. No evidence of flashing and extreme heat of cutting charges acting on exterior columns. With no cutting or bulging in the building’s facade? And somhow “they” got through streets clogged with rubble to dig at the cores of the towers with heavy equipment to get to the “evidence” under 11 or 29 floors of rubble to remove “evidence”. In two or three days after 9/11. From rubble you claimed was melting shoes. Your little rants just make you seem desperate. Good look with your truth movement lies nobody is buying anymore. And you still have no evidence of planted charges at the WTC. When do the software developers here at ATS realize that you can't place quotes nor excerpts inside quotes ? That's why any smart member should replace them with "" ""
Learn to discern between BUCKLING, see my above last post, and BENDING. And learn to behave yourself, at last. Endless insults do not enforce your case. Buckling = deformation failure within the SAME vertical plain the original piece was in. Bending = vectored deformation failure, out of the vertical plain the original piece was first in (or a part or parts of it). And all your ongoing spouting of unrelated links to my posts, is worthless. YOU did NOT post anything regarding steel that was originating from the collapse initiation floors. PERIOD. Any steel from the following natural collapse by overwhelming dead loads suddenly in motion, after an initiation event, is not belonging in this initiation event discussion. It's what every demolition firm strives after. Blow up, and then let nature's forces have a go at it. How do you think those steel inspectors at Cats Kill Island got that bright idea to identify those steel pieces? And wrote their own ID numbers then on them with wax or thick marker sticks. Could it be that these steel pieces were impressed with ID numbers.....at the steel foundry / factory? Which logical process any DnnnNnnn could have thought of himself.! And that the WTC Towers their blueprints are filled to the top with these numbers? Ever thought of that? It never came up to your mind that the steelworkers and engineers at the WTC building site would have had no chance whatsoever to puzzle out a load of freshly arrived steel, to find out where it belonged, without PROPER numbering on it, that indicated placement, as could be determined / read from their blueprints ??? Damn, long ago I could just sent a student like you out of my lecture theater for blatant neglecting of study materials. Here, it costs a lot more patience. It's like talking to a Nnnnnnn Nnnnn, I should however feel some serious pity for. That's why I still try to educate you. You seem to be very reluctant to listen to much older and wiser persons? I have a few good young friends who have it too, saying all the time that they're too dumb to understand it all, but in the mean time they're damn bright..some times! That is, when at last they take the time to listen once in a while, in between their endless monologues and rants. The tiny problem is, they tire me off with that endless fast talking. Still, I consider them my bright young friends. Because I always honor endurance and intrinsic wisdom, even when it only sometimes shines through. Thus. Go first to Major_Tom's EXCELLENT website. It's the BY FAR best encyclopedia for 9/11 OS-trusters, -neutrals, -doubters anywhere on the Net.! It's in fact a damn good mixture of all these interests. He's a very bright and strict evidence based Skeptic, on a quest for the 9/11 Real Truth. Too damn childish to spend energy on. Read the verbatim written out text link I posted several times now already from his 10th of September, 2018 radio interview, Mnnnn. End of the year, NnnnNnnn. Playing dumb to try to Tease a member into a swearing spray and subsequent banning , is a serious forum-crime here.